Our office has the ability to take full spine X-rays. We also routinely take extremity films which are Knees, Ankles, wrists, feet, etc. These films can be developed in our offices within minutes if necessary. Depending on the findings, the chiropractor may call for an MRI or other imaging study of the back. We routinely refer out for MRIs at multiple locations around Hamilton. 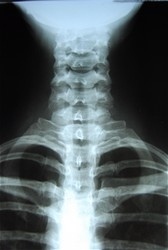 Dr. Murdock has many years experience and additional training in reading X-ray films and MRI films. He will spend spend time with each patient going over the results of these diagnostic tools.